All citizens of the EU have the right to appeal the recent decision to approve massive public subsidies that will enable one of the largest nuclear power stations in the world to be built at Hinkley Point in Somerset. EWS (Elektrizitätswerk Schönau), a clean energy cooperative based in Germany, has filed an appeal against the decision and more than 40,000 people have already joined the campaign. All of the campaign files and background information are available in German, French and English. Please help the spread the word and get more signatures. For more than 40 years Britain has agreed to negotiate the abolition of its nuclear weapons. 14 years ago Britain further undertook to ‘totally eliminate’ its nuclear weapons. Yet the Defence Secretary told Parliament that the ‘Successor’ submar­ine programme would ensure that Britain’s nuclear weapons would remain effective into the 2060s – 100 years after it agreed to get rid of them! We, the people, must demand adherence to international agreements and insist that Trident is not replaced. We are now at a crucial stage in the global movement to rid the world of nuclear weapons. In the UK there will be a decision made early on in the next Government to finally decide if the Trident nuclear weapon system will be replaced. We need to ensure that it is not and that we join the vast majority of nations demanding the abolition of all nuclear weapons. Main construction work on the UK’s first nuclear power plant in a generation could begin as early as December. EDF also have a delegation in China negotiating contracts for the manufacture of pressure vessel and other key components. However rumour is that EDF and the Chinese investors are falling out and Areva (the other state funded French nuclear firm) is collapsing……. Our new petition to Bristol City Council is now online on the Council website. We need 3500 signatures from people living, working or studying in Bristol by the end of October to have the topic discussed by Council. Visit http://epetitions.bristol.gov.uk/epetition_core/view/nuclearfreebristol to add your signature. We will also be seeking Councillors to propose a motion to get the Council to rejoin NFLA. Once today’s election results are in we will be writing to all councillors to ask for their support. There will also be a letter for you to send (by email) to your local ward councillors. Monday 19th May at 11.00 am outside the Wills Memorial Tower, Queen’s Road, Bristol BS8 1RJ. Looks at what is happening to the wildlife in the Pacific! What does China want with Britain’s nuclear industry? The film gives a story of grass root resistance to the power lines built to connect the French EPR (new nuclear build in France) in Flamanville to the European electricity market. Also a chance to meet the French Activists involved in this struggle. Venue: Kebele cafe 14 robertson Rd, Easton, Bristol. 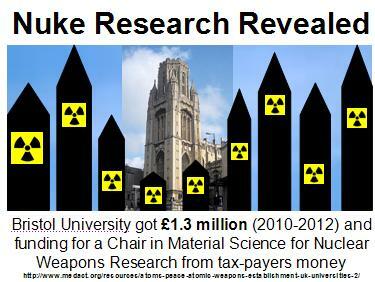 Bristol lies close to 2 nuclear power sites, and has no nuclear emergency plan. We want this to change. The Mayor and several councillors have publicly stated that they are "anti-nuclear". The City is signed up to the Mayors for Peace organisation. The next step is to re-join the UK Nuclear Free Local Authorities (NFLA) organisation and work with other cities like Cardiff and Manchester. NFLA provides support for members on issues like accident preparedness as well as lobbying government on behalf of members on nuclear issues. We currently have a petition to Bristol City Council and are seeking councillors to sponsor a motion to rejoin NFLA before the 2015 Bristol Green Capital year. If you are on Facebook the visit our FaceBook page and Like it.